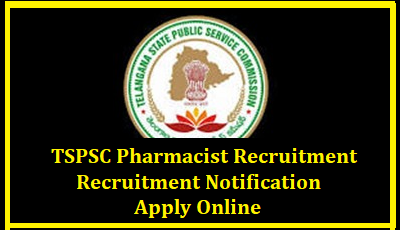 238 Pharmacist Gr-II Posts in DPH & FW, DME and TVVP Telangana: Telangana State Public Service Commission (TSPSC), Hyderabad issued TSPSC Pharmacist Recruitment 2018 Notification (Advt. No. 04/2018) for the recruitment of 238 Pharmacist Grade II posts in Directorate of Public Health & Family Welfare (DPH & FW), Directorate of Medical Education (DME), Telangana Vaidya Vidhana Parishad (TVVP), Telangana State. Eligible candidates can apply online through tspsc.gov.in from 29.01.2018 to 28.02.2018.